My name is Mike Abbas. I have been selling Classic Cars for the past 40 years, and consider myself to be a genuine enthusiast of Classic Sports Cars with a passion for AC, Lotus, Morgan, Austin Healey, Jaguar, Ferrari, Aston Martin, Mercedes, Vintage, Race and most BMC cars!! I have spent the last 40+ years supplying Classic Car garages in Japan, U.S.A., Europe, Australia and throughout the rest of the world. Also, supplying many private fellow Classic Car enthusiasts. For these past years, I have tended to specialise in high quality condition ready to re-sell cars for Trade Dealerships and Classic Car private enthusiasts . 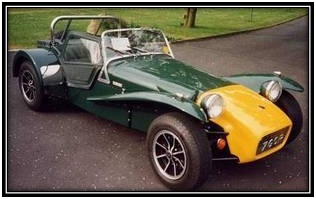 During the 1980s I exported mostly Lotus Sevens, Lotus Elans (1962-73), and Caterham Sevens. I, myself having owned a Lotus Elan Series I, 1963 Chassis No 26/0023 and a very rare Lotus 7 Series III S.S. Holbay Twin Cam Model, and a BDR Caterham 7, I naturally have a big passion for such cars! Also, I had a passion for Ferrari 246 Dinos! I owned a 246GT and a 246GTS. I won the International Award at the Ferrari Owners Club for 'Best Ferrari Dino 246GT'. At the same time during the 1980s I owned a show condition Austin Healey 100/4 and 3000 MK 3- both cars I had fully restored and both cars won the 'International Austin Healey Owners Club Concours d'Elegance Awards'. The purpose of telling you this information is to show you I consider myself to be able to locate good cars with my knowledge, and to be able to sell them at sensible prices. My location is in the North of England where classic car prices are not like crazy high priced vehicles from places such as London and Southern England. I have also built up a vast knowledge of spare part contacts over the past 40+ years, and can usually find the spare part you need and dispatch it to you within 48 hours. I like to consider myself reliable, honest, hard working and passionate for ALL Classic Cars. I would be pleased to help anyone locate any car or spare parts they require. We can handle all aspects of shipping / air freight to any Worldwide destination, at a sensible cost. Please ask for further details. Of course, I have sold many other makes of car. I will try my best to locate any make, and any model, for any customer. Please contact me if you need any help in locating the car you desire or any parts. I will give you my best efforts. Please let me know your requirements and I will find.